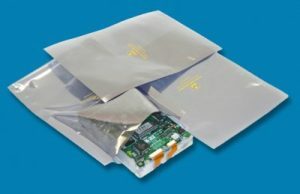 This transparent metal-in static shielding bag is designed to provide a static safe environment for sensitive electronic devices. Bags are printed with an ESD warning symbol. The bags are heat sealable. intended to provide shielding of Electrostatic Discharge (ESD) and to help minimize the penetration of electric field. These bags are tested to meet or exceed certain electrical and physical requirements of Static Shielding Bags, ANSI/ESD S541, and to be ANSI/ESD S20.20 program compliant. Bags are RoHS Compliant and lead-free.